Kung fu can be as varied as the food selection at a Chinese buffet. With more than 2,000 years of history and tradition, kung fu fighting styles have evolved with changing times and new ideas, from traditional tai chi, Wudang and Shaolin styles to the more recent wing chun and choy lay fut kung fu. Regardless of what style you want to learn, all promote better health, a stronger mind and body, and practical self-defense in various confrontations. 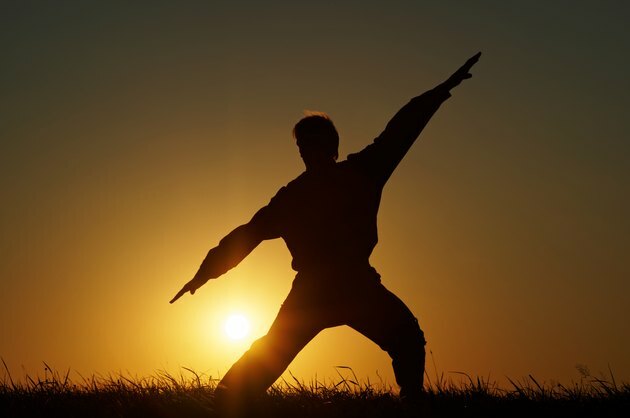 Tai chi is type of internal Chinese kung fu that relies on physical and mental relaxation instead of bodily tension. The primary focus is on breathing, mental clearance and a series of complicated movements that are combative in nature. Although these movement patterns are usually performed in a slow, controlled manner, they can also be performed quickly, especially in self-defense situations. Tai chi is also a type of meditation that incorporates movement, which improves your balance, body awareness and joint health. Because of its low-impact and meditative nature, tai chi can be performed by the elderly daily to maintain flexibility and health. Shaolin kung fu is one of the traditional Chinese martial arts that originated in the Shaolin Temple in Mount Song within the Henan Province, China. It blends the teachings of Chan Buddhism and various types of attacks, defense and wrestling maneuvers as Shaolin kung fu's foundation. It also emphasizes on improving the flow of the "qi," or "life force," that travels throughout the body like a river. The forms and exercises of Shaolin kung fu is also based on ancient Chinese medicine and the principle of the "Six Harmonies." Three external harmonies include the shoulders and hip, elbows and knees, hands and feet, and three internal harmonies include the mind and intention, intention and qi, qi and force. Close-quarter combat is essential for those who must defend themselves from harm in a tight environment where there is little room for maneuverability, such as in a crowded bar, an alley or a small room. Unlike most forms of kung fu, wing chun emphasizes on attacking and defending the body's center line that runs from the top of the head to your groin. It also uses techniques that allow you to strike and defend simultaneously against an opponent's attack. Although wing chun emphasizes on upper-body defense and straight, chain punching, it also works on blocking low attacks with the foot and using low kicks to attack the opponents lower-body joints, such as the knee and groin. Like Shaolin kung fu, choy lat fut uses both long-range and short-range attacks, combining with close-quarter defense, take-downs, joint locks and pressure points, making it a versatile and effective street-fighting or tournament-fighting system. It uses the Baht Gwa system, referring to attacking and defending in eight different directions that involve striking and revolving around a circle, according to Sifu Frank Du, founder of Three Treasures Cultural Arts Society. "There is very little wasted motion and all angles are covered offensively and defensively. From a tactical point of view, a seasoned CLF fighter is very difficult to attack or defend against," says Du.